Surprisingly, our expenses aren’t that much different from when we were living in a S&B (sticks & bricks) home. 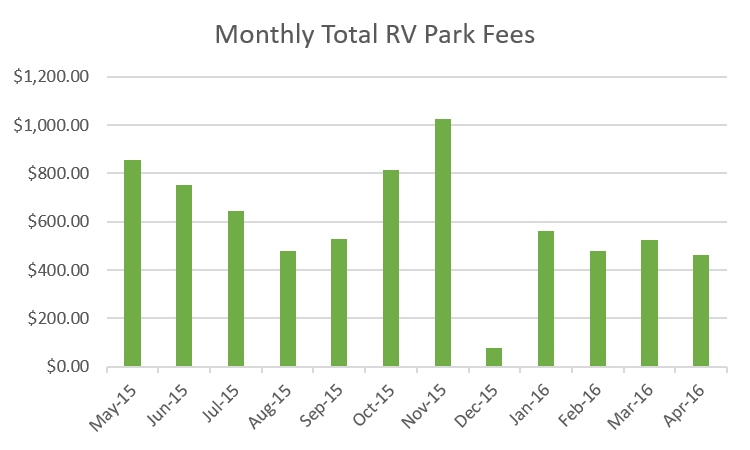 Instead of paying rent or a mortgage, we pay campsite fees. Instead of paying for fuel to commute to work each day, we pay for fuel to travel to new locations. We still have to pay for cell phones, medical insurance, and food, regardless of whether we’re traveling or staying put. Avoid resort-style “destination” parks and KOAs. They are usually much more expensive. This one is surprisingly low for how much we travel. We logged 20,900 miles during our first year of full-timing. That’s an average of 1,741 miles per month or just over 400 miles per week. Our average monthly cost for diesel was $347. This expense is highly variable depending on how much we move. We try not to travel more than about 300 miles between stops and try to stay at least a week in each location. 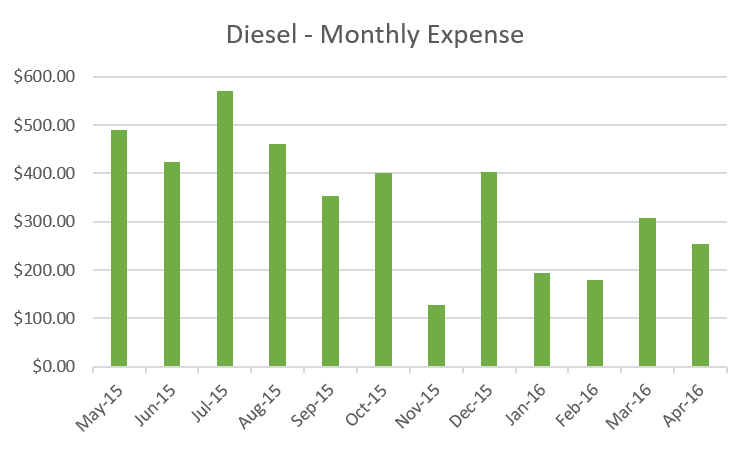 Our most expensive month for diesel was July 2015 at $570. We were moving a lot more that month, driving up the coast of Oregon and seeing as much as possible along the way. It was also the middle of summer with peak fuel prices. Our least expensive month was November 2015 when we only spent $128. We spent that entire month at an awesome RV resort in Mesa, Arizona. Everything we needed was nearby, so we hardly drove anywhere. This one is such a small cost we normally wouldn’t even track it separately, but since it is such an RV-specific expense, we decided to show it anyway. We found out rather quickly that running the furnace on cold nights can go through a 7-gallon tank of propane in just a week or two. With each propane refill costing $20-$30, that can add up in no time. So we bought a ceramic electric heater to heat the 5th wheel when we have electric hookups and save our propane for cooking. Propane is also used to run the refrigerator and water heater whenever we’re off an electric hookup. We use free wi-fi whenever possible, which is available at most RV parks now. But as with most things, you get what you pay for. Free wi-fi typically stinks. When the wi-fi is fast enough to be usable, we use a VPN service that costs around $6 a month to help protect us from prying eyes and hackers. (You can’t be too safe using free or open wi-fi). Our main source for Internet when free wi-fi doesn’t work is through tethering our cell phones. We use T-Mobile with an unlimited everything plan (high-speed data, voice calls, and texting) that’s around $100/month for two lines, in addition to $50 a month until our phones are paid off. Our data speeds have been fast enough to stream Netflix almost everywhere we’ve been (excluding remote national parks and such). We’ve used Traveling Mailbox for over a year now and have been very happy with the service. They scan every envelope that comes in so we can view it all online. We can then choose to open and scan the contents, shred, or forward each item. Scanning is free for up to 35 pages per month, which is more than we’ve ever needed. Forwarding a packet of mail is $2.00 plus postage. We usually have everything scanned, so forwarding charges are rare. 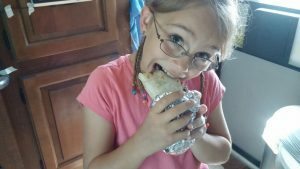 Our food budget is slightly higher than when we lived in a house, about $100 more per month. We spend about the same amount on groceries, around $700 a month for 5 people. We spend about twice as much on dining out. We love tasting the regional cuisine and local restaurants, but try not to over do it and blow our food budget. This is one category that can vary a lot depending on whether things break or not. In a year of travel, we’ve had to replace all four tires, replace the front landing legs, and replace a broken skylight. Averaged out over a year, repairs have cost us $165 per month. Of course, most months this cost has been zero. 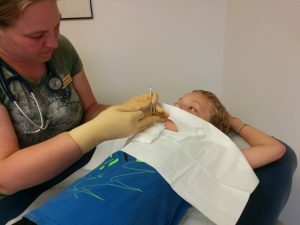 Then there was that one month we had to spend $1700 — ouch! Our full-timer insurance policy runs just under $500 a year. Registration is $211 per year. 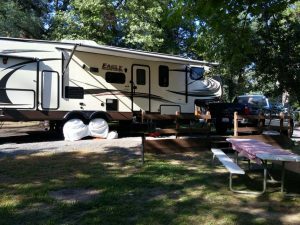 Altogether, our 5th wheel costs an average of $223 a month to maintain, insure, and register. We have been very happy with our 2014 F-250 with a 6.7L diesel. It’s been a champ, pulling our 5th wheel all over the U.S. and back and forth through the Rockies. Normal maintenance and repairs have included 3 oil changes, two new fuel filters, and a new set of 4 tires. This breaks down to an average of $163/month. Insurance has been around $90/month, but we just found a new policy that will bring us down to about $60/month. Registration was another $212 for the year. Our most hated expense is medical insurance. Not to get political, but wasn’t Obamacare supposed to provide affordable insurance? Isn’t it called the “Affordable Care Act”? Ha! We’re paying over $1000 a month for medical insurance, copays, and prescriptions. It’s almost 25% of our total living expenses. Doesn’t sound very affordable to me. We try to minimize recreational expenses by visiting as many free places as we can. 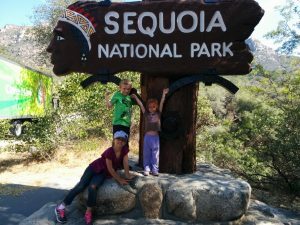 We love national parks–free with an annual pass or a 4th grader (we have both). We also take advantage of free museums, hiking trails, lakes, and beaches. We’ll spend money on the occasional paid-entry museum, but usually avoid theme parks, expensive movie theaters, and other pricey places. This is our largest unexpected expense. By unexpected, we mean this is something we didn’t even think about or factor in before we started full-timing. 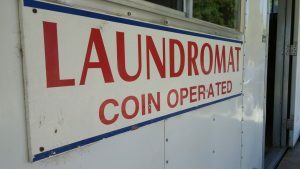 It’s anywhere from $20 to $60 a month depending on the highly variable cost of a load of laundry (we’ve seen it range from $1.00 to $4.50 per load). With 5 people, we usually do around 12-15 loads a month. There is an upside to using laundromats, though. We can get two weeks worth of laundry done in 2 hours flat. We don’t categorize every single cent we spend, so about 25% of our expenses get lumped in our “miscellaneous” category. This includes things like clothing, school supplies, Netflix, snacks, souvenirs, stops at Wal-Mart, little additions to the RV, and all the other little expenses that add up over the month. This is one area we could probably cut expenses if necessary by avoiding sodas and snacks when we stop to fill the gas tank and taking care not to buy extra stuff at Wal-Mart when we stop for a gallon of milk. One way we minimize miscellaneous expenses is by purchasing things on Amazon. We have Amazon Prime (get a free 30 day trial here), which gives us free 2-day shipping almost everywhere, so we can have things sent to wherever we are currently staying. We’ve never had a problem getting our packages. A nice bonus that comes free with Amazon Prime is a huge library of music and videos, which we use all the time to save on entertainment costs. We’ve met several families who are considering jumping into the full-time RV lifestyle. Some do it to travel, some do it to save money. In our experience, our total monthly expenses have been pretty close to what they were living in a normal house. We think it’s definitely worth it since we get to travel and experience so much as we go. 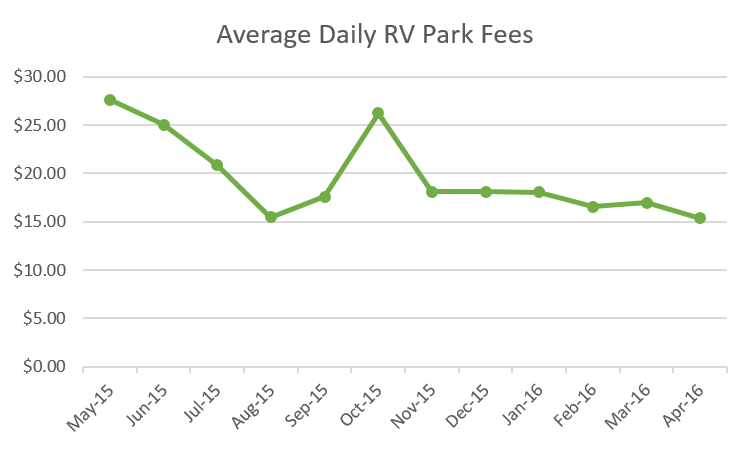 Road Less Traveled: RV Budget & Expenses – What does it cost to RV full-time? 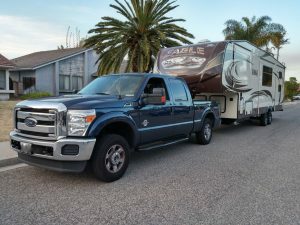 Technomadia: How Much Does it Cost to Full Time RV? Great info! My husband and I are currently on a 5 year plan to sell everything, save money and plan our trip out west. We will be purchasing a 5th wheel in about 2 years as we currently camp pretty frequently around middle TN, but our travel trailer isn’t designed for full time living. Your article made me realize I’ve forgotten some of the little expenses like full time insurance, laundry, etc. We are very excited to start our journey and thank you so much for your great article! Thanks so much for going into the detail for this. It’s super helpful to people like us who are trying to work out if we can afford to do the trip or no. Glad it’s helpful! Some of the biggest things to think about are health insurance (which in most states under Obamacare don’t provide coverage out of state), whether you plan to mostly boondock or stay in campgrounds, and how frequently you travel. Our expenses would certainly be a lot less if we didn’t have to worry about the health insurance and if we stayed in one place longer. Maybe you could consider a “health share” option rather than insurance. We use Liberty Healthshare ($400 per month) and like it. I could send you a referral if you are interested. Thanks Gain for the updated (recent) budget! Thanks for that info about the health share option. We might look into in the near future. Thank You so much on such a complete and comprehensive article on “road expenses”. My wife and I have made the decision to go full time in our Motor home. I am retired Military so I can take advantage of the Fam-camps like you guys but we are new “empty nesters” so our kids are away now and will not be traveling with us. We are renting our house out and committing to a year at least but just in case we want to continue (we are assuming we will continue) we are adding a RV pad to the lot we own next to our house so we can come back and stay for free here in N.E. Oregon where we live now (www.josephoregon.com). The RV spot will be far enough from our rented house to give both us and the house tenant privacy and give us an easy 4 months of free living (except for electricity) in the Summer time if we chose to. We love it here in the Summers so we are sure to spend at least a month or two. Anyhooooo…..You budget really gave me some great information and push to complete our budget. Some of my previous numbers were a bit optimistic while others were pessimistic. I have a very realistic idea based on your numbers and what I estimated or already know based on short trips we have made. For instance I know that for fuel it takes just over .21 cents per mile. I round up to .25 to account for oil and washer fluid and such. Of course it depends on fuel prices too but it is a great number to have when estimating the cost to change locations. I have been guestimating about 1000 bucks per month for fuel and RV parks combined Not even having a clue where to start but your post made this clear what a person can expect to spend. I am going to leave it at 1000 for now and adjust as we get used to things. Thanks again for your time you have committed to your blog. It has been a big help to us.